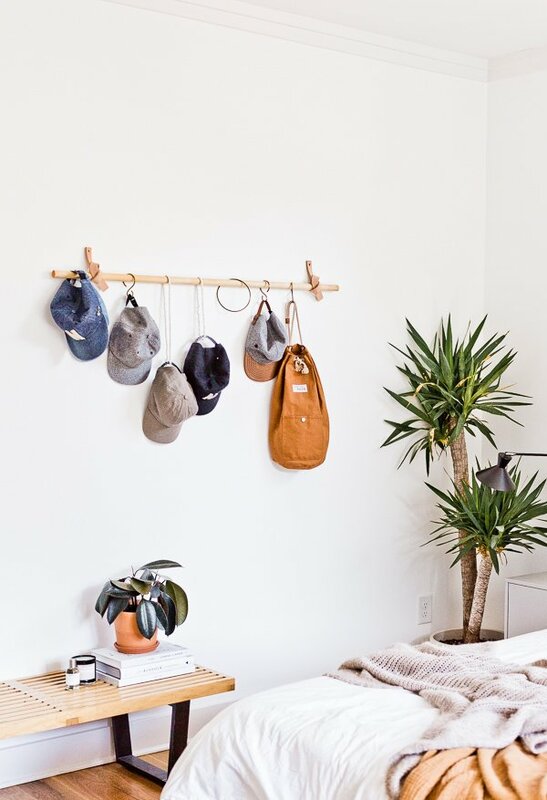 Organize hangable items in minutes with this hanging DIY wall organizer that looks cool and only takes a few minutes to put together. This project is so easy (and useful) that I made not one but two! One for the bedroom and one for the bathroom. 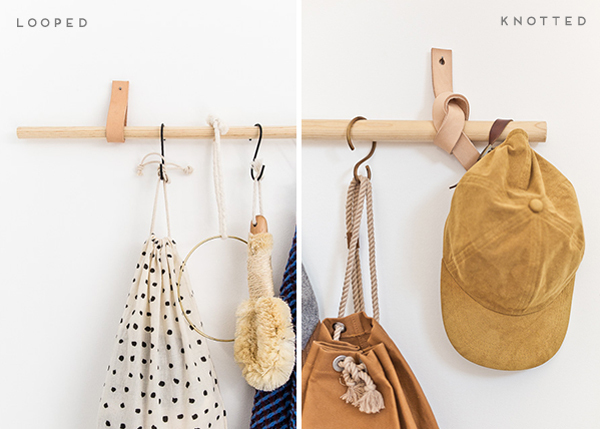 Jeff and I have been using this DIY hanging wall organizer for hats and bags in the bedroom. And then in the bathroom, we use it for towel storage and other bathroom items that get used a lot…my dry brush, the hair dryer (which is in that polka dot bag), etc. If needed, cut your dowel rod down to the size you need, with a saw. I just used the length as is without cutting for mine though. 1. If using a decorative knot like mine, cut the leather straps into two pieces that are each — in length. 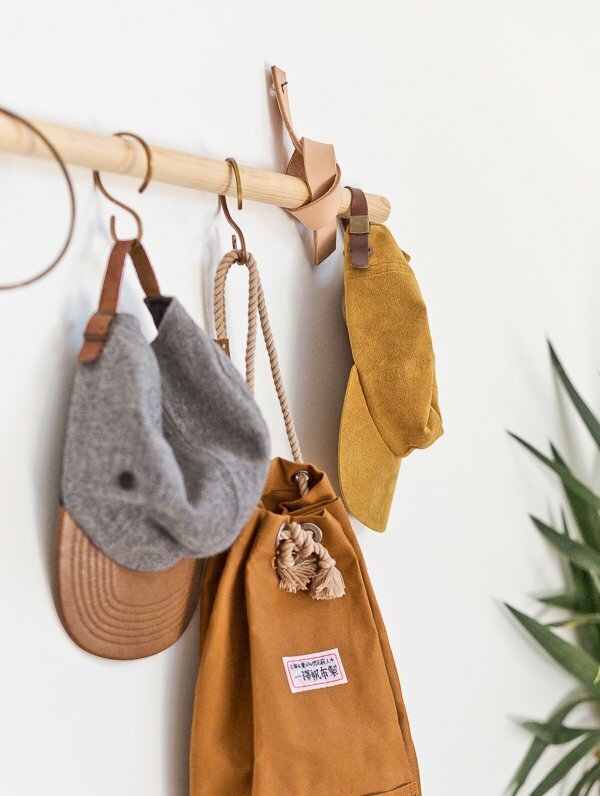 OR for a cleaner look, cut the leather straps into two pieces that are each — in length and fold over around the dowel as a simpler option. 2. 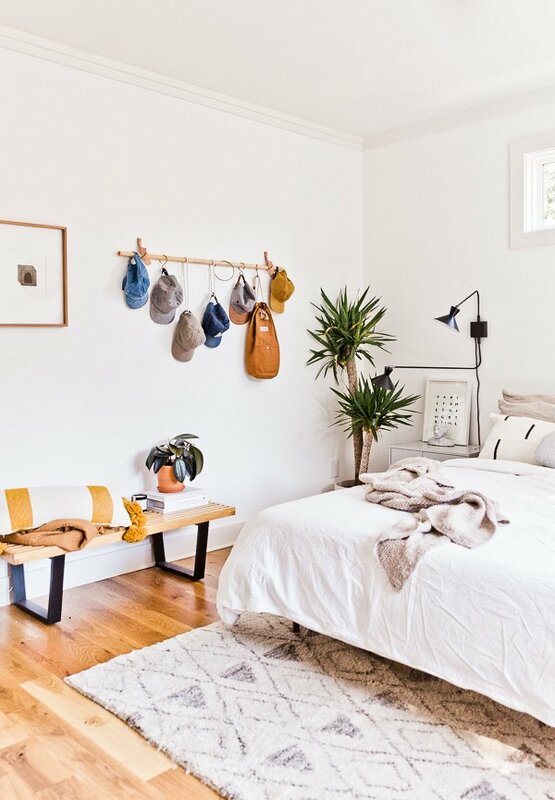 If you’re knotting the leather, wrap both pieces of leather around the dowel rod and knot tightly – leaving a generous amount of leather at the top for nailing into the wall. If you’re doing a simple flap for the leather, skip this step. 3. Next, you can opt to punch a hole in each piece of leather where your nail will go. OR skip this step and hammer straight through the leather into the wall. 4. Hammer the leather into the wall, while the leather straps are attached to the dowel rod. Add S hooks and it’s ready to use. 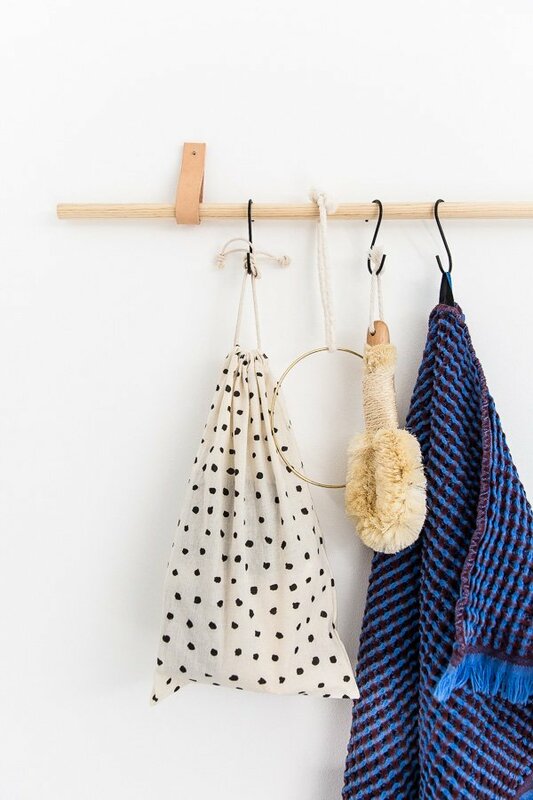 You can also add gold hoops (mine are from Amazon) and corded loops to the finished piece if you run out of S hooks or want a little more variety in the lengths of where things hang, etc. 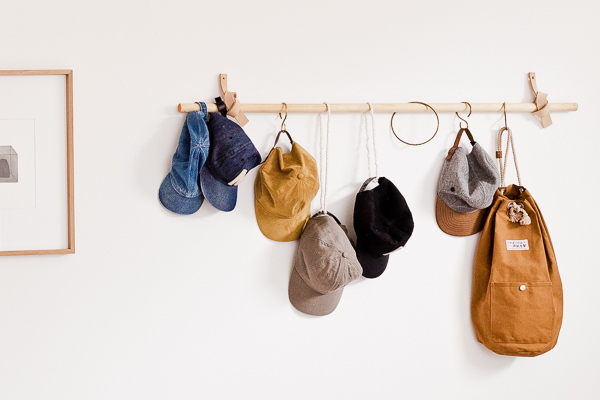 What other ways could you use this DIY wall organizer? Any more ideas for ways to use it? It looks both stylish and is super practical, I love the idea and the combination of leather and wood! This looks so cute! I totally need to try making one! Love the DIY and the design is awesome. I love this! This would be good for keys(depending no the hook size) and scarves too! 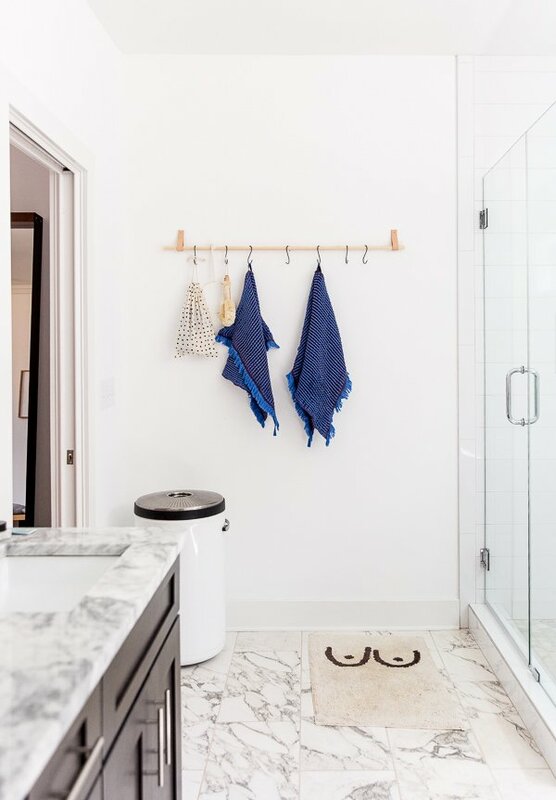 Entryways in homes are the first impression people get of your home so making them cool, presentable, but also creating enough storage space requires some interesting, witty projects such as this one. 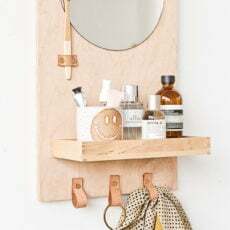 I love the look of this one and the fact that you can totally DIY it.